The halls of the convention center definitely felt a bit more crowded this year. 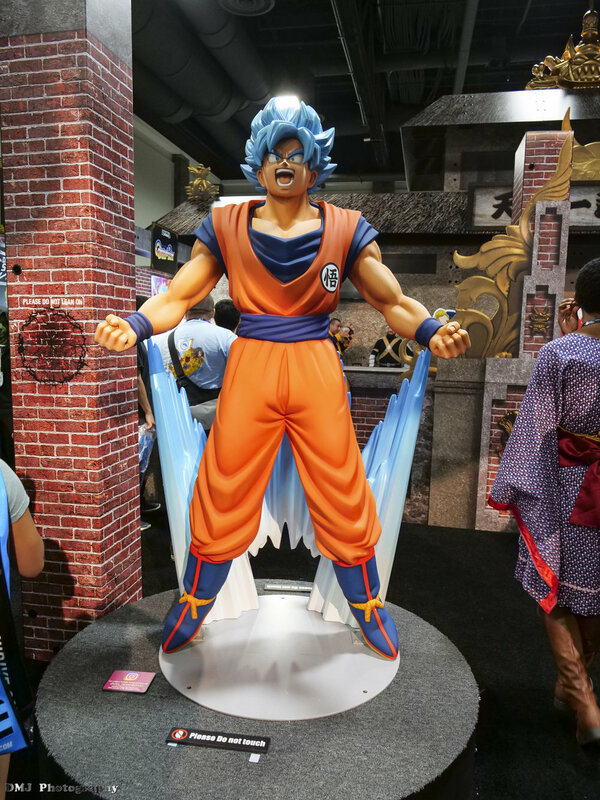 Otakon announced that an unofficial rough count put them a bit over 29,000 attendees this year, which is 4,000+ more than they had last year and it definitely showed. However, considering the size of the DC convention center there is certainly still a lot more room for growth. It was also a cool surprise to see nerdy advertisements when coming out from the Metro Station. I do wonder though if the controversial Unite the Right 2 Rally hadn't been scheduled for this weekend if perhaps that attendance number could have approached 30,000. Last year Otakon had some rooms and panels set up in the adjoining Marriott Marquis Hotel, but this year they seemed to have moved everything into the main convention center itself. The connecting tunnel between the hotel and the convention center was still open to foot traffic and served as an alternate entrance into the convention center. Security checkpoints were once again set up with mandatory bag checks at the entrances that all attendees with bags have to go through (which sadly is still a waste of time and money as the security guards hardly even look into your bags). 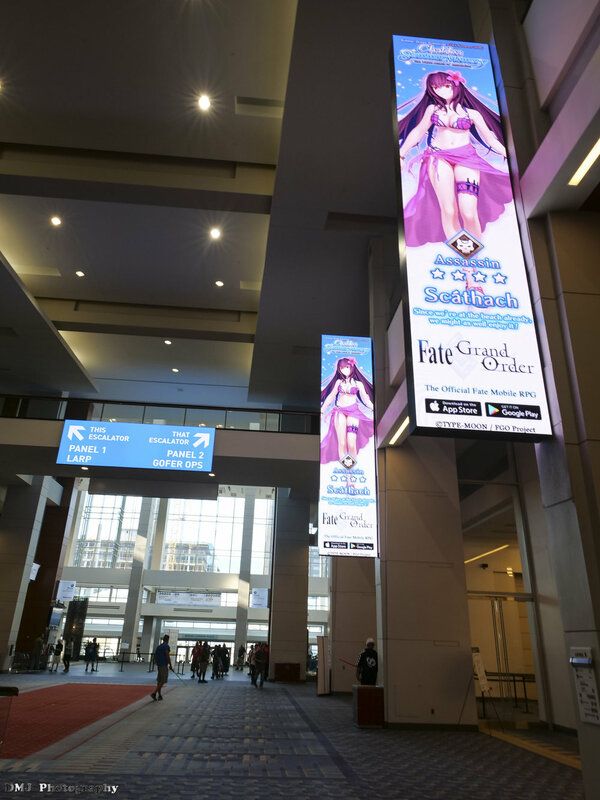 The biggest surprise that I had was seeing lots of video advertisements from the Fate/Grand Order mobile game that ran on the TVs and digital billboards throughout the convention center. As an avid FGO fan it definitely put a smile on my face. I thought they made better usage of the space in the convention center compared to what they did last year, although I'm still not sure if splitting the 3rd level ballroom between a Main Events stage and a Featured Events room is truly wise as it limits the amount of people that can attend a main event like the concerts and Masquerade contest. 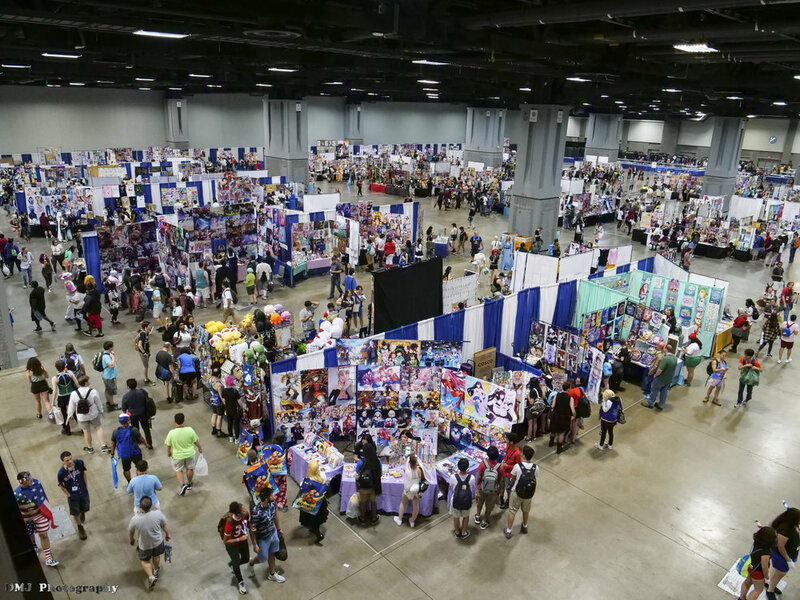 The Dealers Room and Artist Alley are still housed in their respective ginormous show floors which is such a refreshing feeling compared to the cramped booths that they had in Baltimore. 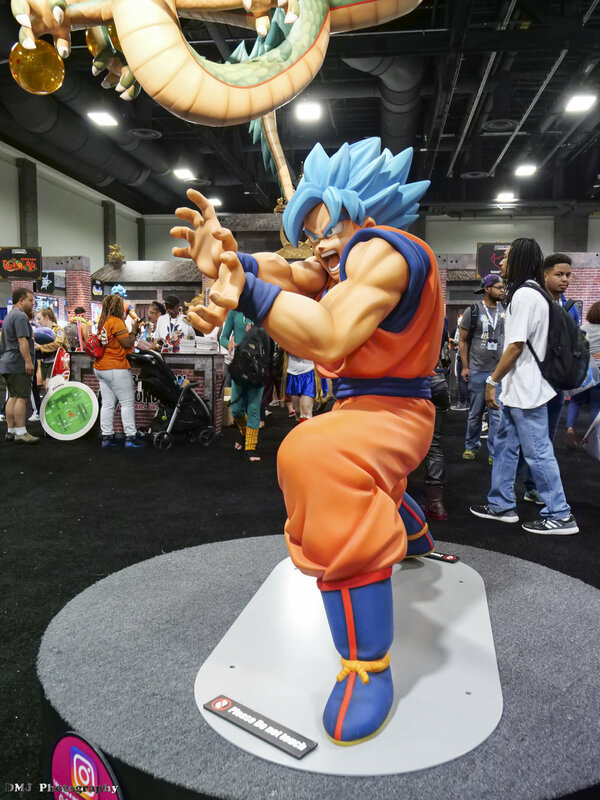 This year Funimation is holding their big Dragon Ball Tour across the country and Otakon is one of their many stops. 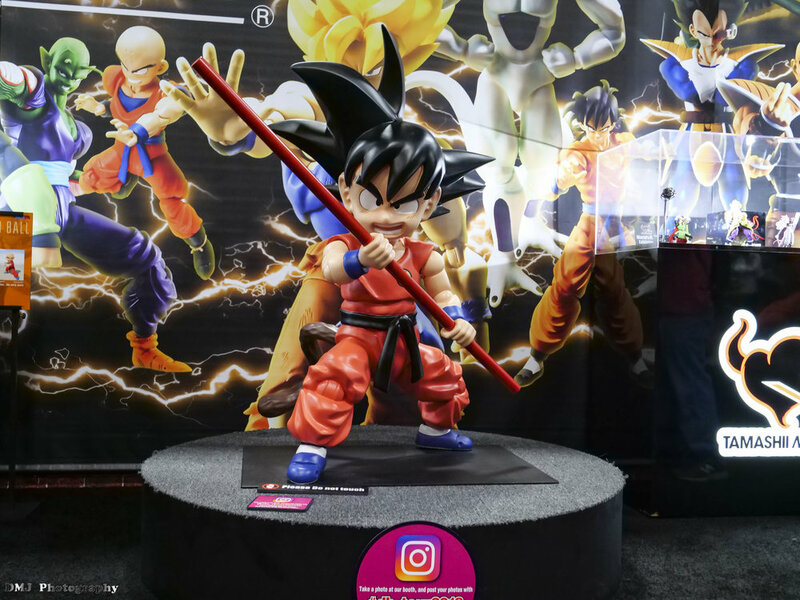 The booth/event space that they had in the Dealers Room was a very impressive display and probably one of the most elaborate setups that I've seen at an anime convention. In terms of food options, there were the usual convention food stands and mini-restaurants. 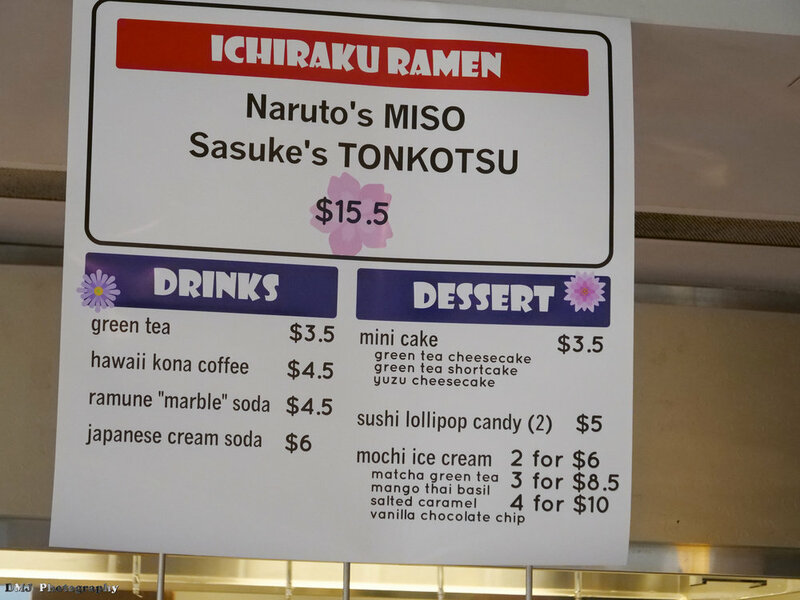 But like last year the Downtown Food District was where the good stuff was as they once again brought back the Japanese and otaku-themed foods. It may be an over-priced rip off, but it was a deserving rip off. They did have regular American food options as well, but why go for those when you could go full weeaboo? Going back to their usage of the convention space they once again set up four official cosplay photoshoot locations to have gatherings at. Last year I had issues with two of the locations (the grand staircase at the main lobby and at the bridge/overpass) because the gatherings would cause major bottlenecks or obstructions to foot traffic which often resulted at us being yelled at by the staff. This year they relocated the two troublesome spots to new spots which was a great improvement, but in the end other factors continue to come into play that Otakon needs to think about. Some of the photoshoot locations ended up getting forcefully relocated throughout the weekend because the lines snaking from the 3rd floor Main Events hall (such as the Distant Worlds: Final Fantasy concert) would run right into those photoshoot areas. I think Otakon is heading in the right direction for their photoshoot coordination but they still need to rethink how the locations will be affected by other factors that occur throughout the weekend. Plus they really need to figure out where a super-sized gathering (like My Hero Academia and the Fate Series) would be able to go as many of their shoots were just straight up clusterfucks because of the small spaces that they were at. Other issues that occurred throughout the weekend included lots of Guest panel cancellations because Otakon's right hand can't seem to talk to their left hand and they kept "accidentally" scheduling Guest panels when there wasn't supposed to be one (I don't even know how that can "accidentally" happen, and multiple times at that). I also wish they would have updated their Guidebook app to link the Guests to their respective events so that attendees could find out what panels and events a certain guest would be at. Another complaint from attendees was that they changed the popular "Voice Actors After Dark" panel from an 18+ panel to an all-ages panel with no explanation for the sudden change. I also would have liked to see more of the voice actor guests have solo or group Q&A panels as many of them seemed to only be there for autographs and industry-sponsored panels. And finally I also saw a lot of (second-hand) complaints about the autograph lines being disorganized with little communication from the Otakon staffers as well. All-in-all, I thought that this year went pretty well although it was evident that they still have a lot of growing pains to overcome at this new location. 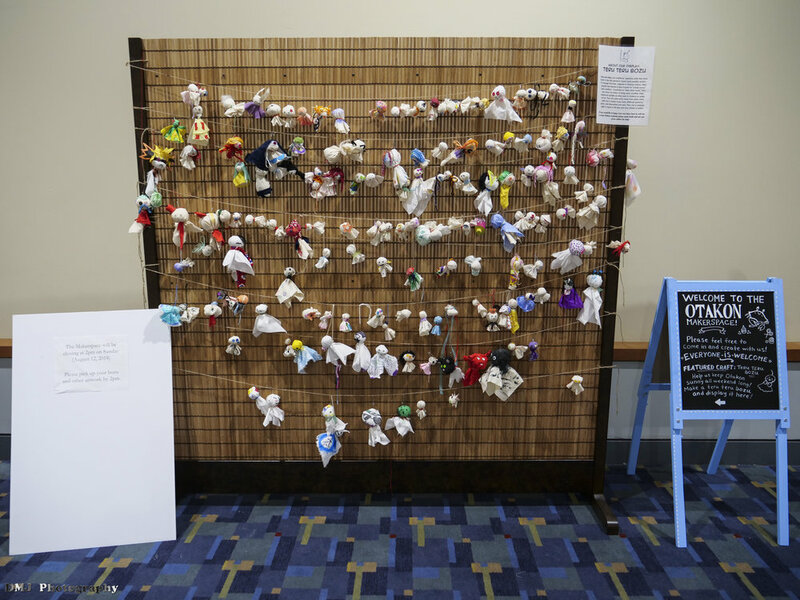 To end things on a positive note, I thought it was cool seeing a lot of Otakon attendees making teru teru bozu charms to keep the rain away (kind of worked?) during this abnormally wet summer. Click here to go to my Facebook photography page where I uploaded the photos that I took at various cosplay photoshoots which include the Tales of Series, Fate Series (Friday), Final Fantasy Series (Friday), a Fate Series shoot at the Aniplex USA booth, a Persona 5 shoot at the Aniplex USA booth, Overwatch (Saturday), Persona 5 (Saturday), and Fate Series (Saturday). Click here to go to my YouTube channel to view videos that I recorded of the "PERSONA 5 the Animation Steals Otakon!" Panel, the "Sword Art Online Summer Festival 2018" panel, voice actor Todd Haberkorn's Sunday panel, voice actor Bryce Papenbrook's Sunday panel, and the full cosplay Masquerade contest (video still processing by YouTube as of the posting of this article).